Looking for a Quality Gas Pressure Washer for Your Home? Mi-T-M and Husqvarna are two of the most trusted pressure washer brands in the business. These brands offer pressure washer solutions for just about every residential or commercial requirement. After having a pressure washer around your home or business, you will wonder how you lived without one! Pressure washers can be used to clean decks, patios, pools, driveways, walkways, siding, gutters, windows, and to wash your car too! 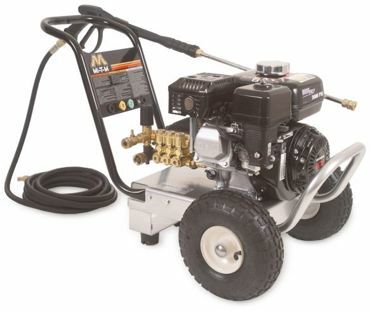 Mi-T-M pressure washers come in a variety of sizes and are designed and tested by professionals. We carry quality pressure washers for residential and commercial use from 2400 psi and up. Cold and hot water pressure washer units are also available (hot water units are special order, call us today for details). Have questions about which pressure washer is right for you? Our outdoor power equipment specialists are here and ready to help. Give us a call or stop in to one of our local stores in Boardman or Warren, Ohio. We've proudly served the residents of Mahoning and Trumball counties for more than 65 years.